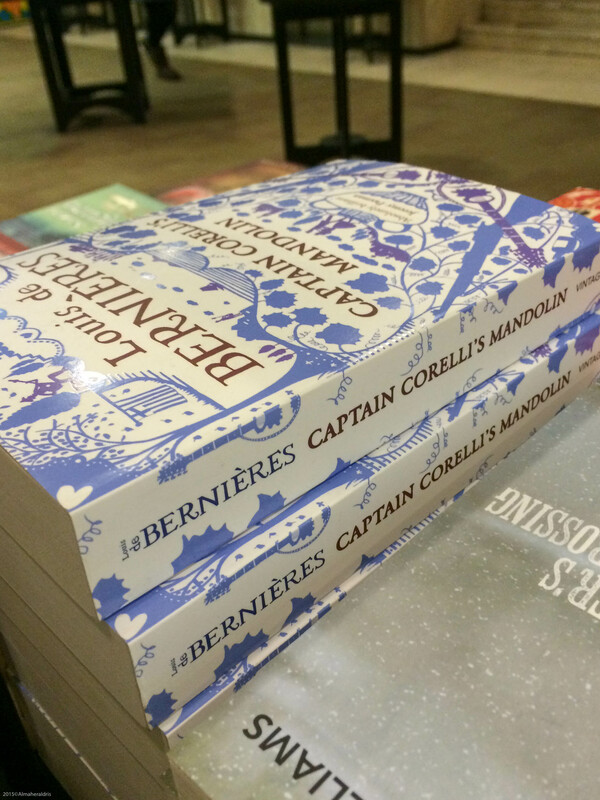 When I saw Captain Corelli’s Mandolin sitting quietly amongst all the other books on the table, I was brought back to an interview I had several years ago, with my then-would-be-boss, just before I joined his department. In the middle of the interview, he asked me what book I was reading at the time. The question threw me off a little; not due to the nature of the query, but rather the timing of it. It was completely random and out of the blue; it had little to do with the questions that preceded it, and even less with the questions that followed. I was reading Louis de Bernières’ Birds Without Wings at the time, and answered his question accordingly. He wasn’t familiar with the book, so I explained what it was about, and that it was written by the same guy who wrote Captain Corelli’s Mandolin. Unfortunately, that didn’t ring a bell, either. At the back of my mind, meanwhile, I was trying to figure out the significance of his question; what was he trying to assess? What genre I read? How extensively I read? Whether or not I read at all? Was he expecting my answer to be some finance- or investment-related publication? Frank Fabozzi, perhaps? Was I going to flunk this interview because of my choice in literature? And just as quickly, he left the subject of books and continued with his earlier line of questioning, as if he’d never asked the book question at all. The Boss: So what do you do in your current role as bla bla bla? Me: I’m in the bla bla bla team where I’m responsible for bla bla bla. Right now I’m working on la dee da where I look at so-and-so and dum dee dum. The Boss: What were you doing prior to that? Me: I was in the la dee da team, where we examined the financial and overall health of tra la la. It required us to analyse the wonky-wonks and the donk dee donks of the tra la la. The Boss: What are you reading right now? Me: (completely thrown off, I blink for a second while I process the question) What I’m reading? As in, books? The Boss: Books, magazines, anything. What are you reading? Me: (a moment’s hesitation while I mentally search for sneaky traps in the question) Err… Birds Without Wings. The Boss: Birds Without Wings? Me: Yes. Written by Louis de Bernières; the guy who wrote Captian Corelli’s Mandolin. The Boss: What’s it about? Me: Well, I’ve only started reading it, but it’s about so-and-so and bla bla bla who essentially la dee da and tra la la. The Boss: (without missing a beat) So when you were in the bla bla bla team, did you work on la dee da? Me: (wait, did he just jump to a random topic and then switch back? Is this really happening?) Not really. I was more into the dum dee dum aspects of the la dee da. The Boss: I see. So you graduated from doop dee whoop, right? In Accounting and Finance? The interview went on for a bit longer without any further mention of – or any reference to – books, reading, or any other random topic. I joined the department shortly after, so I suppose my choice in literature didn’t harm my chances too badly. Until now however, I can’t fully understand that blip; that detour. But every time I spot either Captain Corelli’s Mandolin or Birds Without Wings, I’m transported back to that day, in that office, and in my mind’s eye I watch a replay of the interview. What’s the most random interview question you’ve been asked? This entry was posted in Blog, Conversations In My Head and tagged books, nostalgia. Bookmark the permalink.